I shared my heart with my Lifegroup sisters recently about my desire to not just exist, but to Live. I don’t believe I, or anyone, is called to live a lifeless routine of working and sleeping. And yet, this is exactly what I’ve been doing. My heart’s desire is to move beyond existing to living. We talked about what it means to live and then discussed Casting Crowns’ song, “Thrive” and what it means to thrive. I don’t know why, but I didn’t have a clear grasp of what the word, thrive, meant. After arriving home, I cracked open my digital dictionary and noted the definition: to prosper and flourish; to grow; to develop well. While the dictionary definition shed some insight, I knew … just KNEW … there was more so I checked out the “story behind the song” to dig deeper to find it’s scriptural foundation. I am thankful I did! I want to be like that! To be like a tree planted by streams of water, my roots digging deep and drinking continually from the everlasting water of God’s Word! The result of all this digging and drinking? Reaching out! That’s the other desire of my heart: to share Christ with my community … my neighborhood, my colleagues. To “be there,” to be an encourager. I believe the Lord is confirming some things for me and I’m excited! For now, I’ll keep drinking deeply from the Word. I can’t wait to see what He’s got in store for me! I was texting with a couple of my LifeGroup sisters a few weeks ago discussing the topic of compassion. The subject came up following an opportunity our church fellowship had that morning to pack food boxes for families with the Children’s Hunger Fund. One of my sisters commented that it’s super-easy for us to whip out our check books and contribute financially to someone in need or to help each other out when a need arose, but when it comes to us being Jesus’ hands & feet in our community we fall short. That conversation really struck a chord of conviction in my heart and I’ve been chewing on it and sincerely searching for opportunities to serve my neighbors and those in my community since then. There have been a couple of opportunities I’ve seized/embraced over the past week and a few others I’m still working on for our LifeGroup to become involved in. Serving others isn’t always convenient. I have been wrestling with this since our texting conversation and I had to be truly honest and admit to being very lazy in my service to others. If I can’t afford to give out of my excess … be it time or finances, I find excuses why I shouldn’t participate. There are times when we can help others out of our excess and there are times when service is truly sacrificial. The key, I’m finding, is to look for the opportunities and to be available when the Holy Spirit prompts me to help others. Have I come to the point where my service is exclusively sacrificial? No, but I hope I’m getting closer. Much of my service is still out of the excess I’ve been blessed with. The thought of true sacrifice scares me because when I’m truly honest with myself, I have to admit something: the only way I will be able to be truly sacrificial in my service, in my giving? By being fully reliant on God. Does that not blow your mind? I know it blows mine. This is the time of year when several of my friends commit to giving up “things” for the next 40 days. Chocolate, coffee, Facebook … I’ve seen each of these noted as items (or in the case of Facebook, habits) deemed necessary to give up. 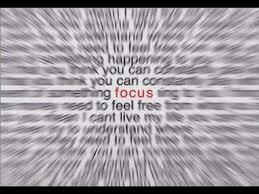 My word for 2014 is “Focus.” My reasoning? Urgent issues happen but they aren’t always important. I dedicated 2014 to focus on the IMPORTANT. Specifically, God and family. The Lord is faithful to help me stay focused. For instance, my home church, Northeast Bible Church, started compassion challenges last week. The first challenge was to provide a meal to an “unsung public service worker.” Personally falling into that category, I had a difficult time figuring out how to do this until I began to think about all the staff that work with me behind the scenes of education. Which led to a joyful lunchtime surprise for one of my campus clerks. Our current challenge is a lot more challenging for me. We are challenged to write a note each day telling the person we’re writing to what we like about them. Easy enough. But wait, there’s more: we’re also challenged to write at least one note to someone we struggle to be around. Whoa. I have one of those and that note will definitely be drafted by the Holy Spirit because if I try to write under my own power, it will come out all. wrong. These challenges are providing opportunities to be grace & compassion in action! Wonderful news! Our Lifegroup began a new study last week titled, Love Does. My big-picture takeaway from these 40 days is to not stop finding compassion challenges on Resurrection Sunday but to dedicate the rest of my life to share God’s grace & compassion with those around me. Hub & I joined the fellowship at Northeast Bible Church a little over a year ago and have been incredibly blessed in so many ways by the people that comprise this community. It is a family. WE are a family: a family with a mission to reach the population of the surrounding area and share the love of Christ with them. One of my first friends at Northeast led a Bible study I attended last summer on the book of Ephesians. I remember that at our first meeting, she asked us to share prayer requests specific to our own needs. Mine was (and is) to share grace with those around me. Looking back over the past 10 months of my walk with the Lord, I believe that moment was when the Holy Spirit started working with me to take mySELF off the Throne and let Him again be the Lord of my life … when the formation of my One Word took root in my heart. These first 100+ days of 2013 have been an interesting journey: from beginning this quest as an intellectual pursuit of what it means to be compassionate, to sharing compassion with others, to one where I am now searching my heart and waiting for God’s leading on how He wants to use me in situations and circumstances around me. Hub & I have been talking a lot about God’s will. We both agree that it can’t be a matter of God’s will on our time but waiting and watching for God’s will on HIS time. 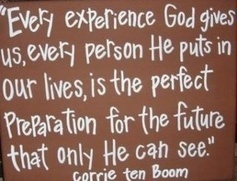 And this is why Corrie ten Boom’s quote above is so meaningful to me. We don’t know what’s coming up around the bend … when the next trial will begin or when the seasons will change. He does, and He provides all that we need to walk through this journey. Brennan Manning went home to be with the Lord last weekend. I never met the man in person. It’s nothing out of the ordinary: I haven’t met lots of people. But that’s okay. We’re not called to meet everyone face-to-face that has an impact on our lives. While I’m eternally grateful for the privilege of meeting some and doing life with others, I meet many of these people through their writings. And this is how I met brother Brennan. I’m reading his book, The Ragamuffin Gospel and am being blown away at every page turn! Though the Scriptures insist on God’s initiative in the work of salvation – that by grace we are saved, that the Tremendous Lover has taken to the chase – our spirituality often starts with self, not God. Does this not blow your mind? How many times have I been so impatient with His timing or silence that I’ve taken matters into my own hands? So … what am I learning about compassion? Compassion & grace go hand-in-hand: it’s not just about the physical activity of loving and serving others, but about the glorious gift of a Passionate Pursuer who gave everything; there is nothing any of us can do to “earn” His love. I’m going about this all wrong. I thought I could learn compassion as if it were a class in school. Take one verse a week, study it from every possible angle and move on to the next verse. I sat with a friend in Sunday School last Sunday. He’s not been well lately. As we were transitioning from our small circle to the long rows for class, I asked him how he was doing. There are times when I’m so lame. I realized my gaff and asked if he was enjoying the weather. He smiled and said he was. I prayed he understood I meant no harm.